Ashton Kutcher is easily one of the most recognizable faces in Hollywood. He is a popular actor and has starred in several romcoms as well as some serious dramas. They include No Strings Attached, Guess Who, A Lot Like Love, What Happens in Vegas and more. Kutcher has also appeared in TV series such as That 70’s Show and Two and a Half Men. Kutcher’s talents does not lie on the screen alone as he is also an accomplished producer. His production credits include the popular MTV show, Punk’d. The show was about pulling off pranks on unsuspecting celebrities. Some of his famous ‘victims’ include the likes of Justin Timberlake and Tyra Banks. Find out more about Ashton Kutcher here including his wife, kids, age, twin brother. Christopher Ashton Kutcher was born on the 7th of February 1978 in Cedar Rabids, Ohio. He had his education at various schools such as Washington High School and Clear Creek Amana High School. On completing his high school education, Ashton Kutcher proceeded to the University of Iowa to study biochemical engineering. This was in the year 1996. In college, he did various odd jobs and even sold his blood just to meet up with his tuition. While studying in the university, Kutcher was scouted by a local talent agent who urged him to try his hands at modelling. He heeded the advice and entered the Fresh Faces of Iowa Contest in 1997. He won the contest and thereafter moved to New York where he signed up with an agency. The agency helped him land modelling gigs with designer brands such as Calvin Klein and Abercrombie & Fitch. He also worked the runways in European fashion capitals such as Paris and Milan. Ashton Kutcher broke into Hollywood in the year 1998. This was on the series, That 70’s Show, where he played the cute but dim-witted Kelso. Since that debut, Kutcher has appeared in several other movies. Even though Kutcher comes across as a goof in the movies, he is quite a serious fellow in real life. He has spoken out about issues such as gun control, and sexual exploitation of children. Ashton Kutcher was the very first person to gain one million followers on Twitter. This may not be unconnected to his outspokenness. 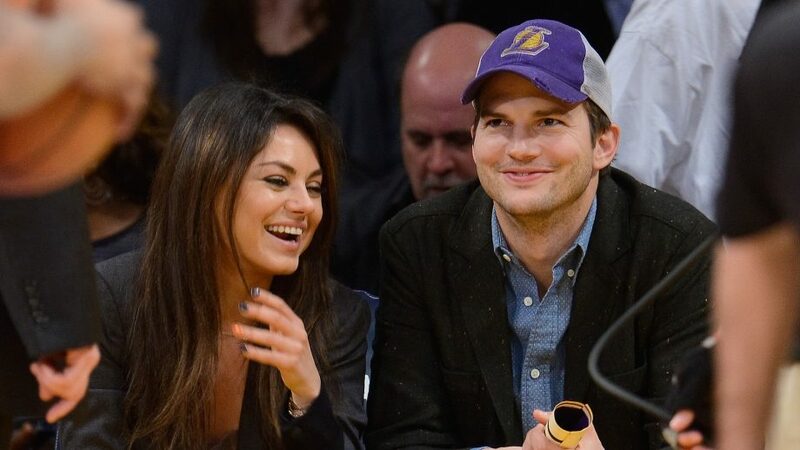 Ashton Kutcher is married to a fellow movie star, Mila Kunis. Kunis is a popular Hollywood actress and has featured in movies such as Friends with Benefits, Ted, The Book of Eli and more. Kutcher and Kunis commenced their relationship in April 2012 but had been friends even before that time. They got engaged in February 2014 and got married in July 2015. The couple have two kids together. They are daughter, Wyatt Isabelle (born in October 2014) and son, Dimitri Portwood (born in November 2016). However, Kutcher’s marriage to Kunis wasn’t his first as he was previously married to the legendary actress, Demi Moore. They got married in September 2005 and the union caused quite a stir as Kutcher was 15 years younger. They were however unfazed by the scrutiny. The marriage lasted for six years before they separated in 2011. Their divorce was finalised in 2013. The actor hails from a conservative middle class family. His father’s name is Larry Kutcher while his mother’s name is Diane. Kutcher has Czech, German and Irish ancestry. He has two siblings including an elder sister named Tausha. Kutcher also has a twin brother named Michael. His brother has cerebral palsy and suffered serious health challenges. He had to get a heart transplant at the age of 13. Michael credits his brother with being by his side through the years as well as protecting him from bullies when they were younger. Michael is now married with children and is a spokesman for Reaching for the Stars which is a charity that promotes the interest of children with cerebral palsy. Ashton Kutcher is one of the richest actors in the world with a fortune worth $200 million. He made his money from his acting and production gigs. Additionally, Kutcher is also a renowned investor and has backed lucrative tech start-ups such as Pinterest, Shazam, Uber, Skype, Airbnb etc. There is no gainsaying the fact that he must have earned millions of dollars from such investments. The actor also owns an investment firm known as Sound Ventures. The Iowa native is quite tall as he stands at 6 feet 3 inches. This translates into 1.89 m. His weight, on the other hand, is listed as 80kg or 176 lbs.